I don't think you know how excited I was to actually decorate my room like I was itching to do it all November. So I am so excited to show you my room tour 2017. My bedroom feels so magical and puts me in such a good mood. This post is very photos heavy, so enjoy! Merry & Bright garland is from last year from Matalan, as well as the stag cushion. The multi stag cushion is from, Next and the Xmas sign is from ASDA. Then we have my favourite part of my room, my dresser. I always put so much effort into this part as it the part of my room I see the most! The tree I bought last year from Next and I just find it so pretty! I added baubles from TKMaxx aswell Cadbury chocolate and a crown I got last year from Linea. The penguins are from Tesco and the Polar Bears are from Matalan. The frosted berries are from Next from a few years ago and the plant I bought from Ikea, which I then added fake snow. Over the summer I added my shelf back onto my wall, I think it adds depth, height and a great place for candles and more candles!! Candles are from Bath and Body Works and TKMaxx, the sign I got for my Christmas!! 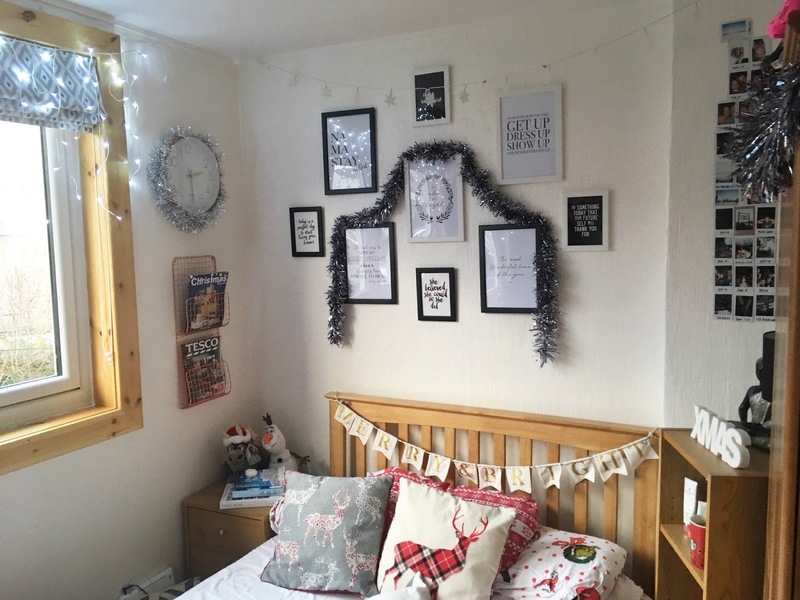 I would love to hear what you think of my room and I would love to see your room tours! Hope you are having a festive day!